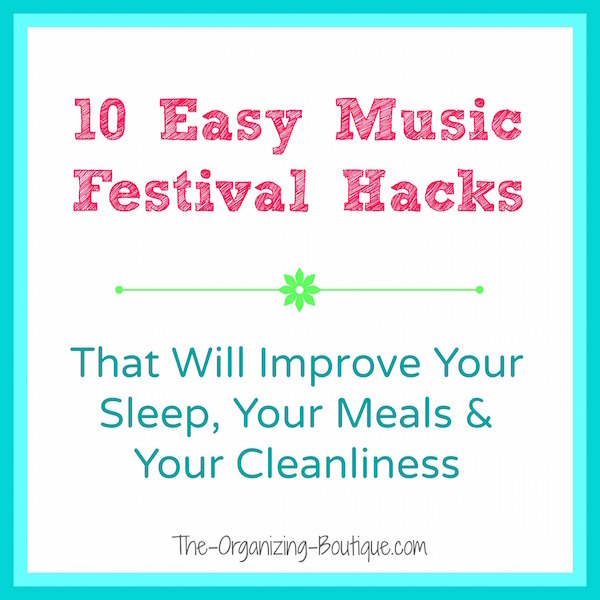 Ten music festival and camping hacks that rock, according to a professional organizer and veteran festival goer - that's me! But we have done it, so without further ado and in no particular order, here are 10 music festival hacks that will make your glow sticks shine even brighter. Enjoy! 1. Cut up fruit and vegetables before hand. Bringing food that is ready for consumption just makes life easier. Rather than having to cut or peel or find a clean surface so that you can cut and peel, you can simply pull the container of cut up carrots out of the cooler and dip them in the hummus. It's faster, it's easier, it's smarter, it's cleaner...it's better. Do this for fruit, vegetables, anything that won't go bad quickly once it's cut up and will be easier to consume once it is. 2. Get water tight food storage containers. By the end of every day, the ice in your coolers will have melted and your food will be floating in water until drained (which typically happens the next morning). Rather than letting your food drown and possibly get ruined, use water tight food storage containers. FYI - Ziploc bags don't do that good of a job keeping the water out. Most music festivals do not permit glass bottles. As obvious as this is, don't forget it! One year, it slipped my mind and the Starbucks coffee drinks I had just purchased were confiscated. Blast! I was really looking forward to those too. This goes for alcohol as well. If you're adult beverage comes in a glass bottle, then transfer it to a plastic one. 4. Don't hate the fanny pack. This is one of my best pieces of advice. I LOVE my fanny pack. First, it is so hot and humid during the day that I avoid holding anything unnecessary. With the fanny pack securely buckled around my waste, I don't need to hold a purse or any type of shoulder bag. Secondly, the fanny pack puts everything I need at my finger tips. I can get out my lip balm or my phone or whatever in a snap. Thirdly, it is attached to me so I don't need to worry about leaving it somewhere because I needed to set it down or whatever. Fourthly, again, it is attached to me. I don't need to worry about it falling off or down when I go into a porta-potty. Eww. Fifth, they are making some really awesome fanny packs now. Here are some to check out. 5. Paper towels are better than toilet paper. This is also one of my best tips. Toilet paper falls apart in the humidity and sticks to you. Yuck! Hands down, paper towels are better at getting the job done. Enough said. There are tens of thousands of people wandering around a music festival, and it's really easy to lose sight of your crew. One of the things that we did was pick a certain section (e.g. the back left corner near the speaker) of each stage, so we could find our group members or meet up with them later or what have you. 7. Something tall, something bright. To add on to the last tip, it's even easier to locate your crew (especially at night) at the stages when one of them is holding something tall and bright. For example, one year we had one of those pool noodles and decorated it with twinkling lights. That way, our friends could look in our designated section (like in the previous tip) and easily spot our lighted pool noodle. They could find us no matter where we were. One year, a friend that we didn't even know was at the music festival found us at night in the sea of people in the audience of the biggest stage. I looked over and suddenly he was just there, sitting on our blanket watching the show with us. Puzzled, I said, "Hey! I didn't know you were here! How did you find us?" He said, "You guys always have the most lights" (aka glow sticks galore). LOL. It works. 8. Use the water from the melted ice in your cooler. Don't waste it. This water is cleaner than you think and can be used to wash dishes or rinse the sunscreen and bug spray out of your hair. I recommend you NOT use the water from the food coolers, but the coolers holding the drinks should be fine. 9. Don't sleep on the ground. We did this for several years. An air mattress had just not occurred to us. Sigh. Anyway, lesson learned. Even if you have a tarp under your tent (which we always do), if it rains hard enough, water can get under there and seep in. Hence, if you're not raised up in anyway then you're going to get soaked. It's miserable. I've woken up completely drenched from underneath, and wet blankets are terrible! Get an air mattress or a cot, and stay dry in your slumber. You're away from work, from school, from normal life. Give your mind and your personality wings, and let your freak flag fly. If you want to show off your tattoos, do it. If you want to wear crazy outfits, do it. If you want to hula hoop with an LED hoop, do it. If you want to dance like a wild person, do it. If you want to give out free high fives, do it. Be free. Just do it. Sign up below for 3 unusual but MUST-HAVE items you should pack for a music festival.